Author: Marilia Duque, São Paulo. We started our classes as a very heterogeneous group with people who had never used WhatsApp before and people who already pay bills, buy stuff and book flights using their smartphones. After conducting interviews with some of them, I would say the group could be classified in two key categories: the ones who are afraid of “being overcharged”, “erasing some important information” or “pushing the wrong button” and ruining the device itself and the ones who are disposed to take more risks, using trial and error as method, without any concern about spoiling the device. According to the survey Tech Adoption Climbs Among Older Adults (Pew Research Center, 2016), lack of confidence is one of the main barriers that can “hinder some old Americans from going online and using new technologies”. One third of seniors feel little or not at all confident when using electronic devices (including smartphones) and because of that feeling three-quarters of them say they need help to set up and start using a new device. One of my students, Mr. M. (72), said this fear of making mistakes is the key difference between old and young people. If youngsters say something wrong, they laugh at themselves, because they are allowed to make mistakes. However people are not so tolerant with older adults. Because of that, he said, many of his friends feel so embarrassed when they fail that they became too scared to even try. But what could be achieved if all this fear is gone? According to the same Pew Research Center study, once the seniors go online, they engage “at high levels with digital devices and content”. Among older adults who own a smartphone, for example, 76% uses the Internet several times a day or more. In my WhatsApp course, as the group became more comfortable in making mistakes, I might say they learn more and faster. They now know almost everything about WhatsApp main features: how to create a group, how to share a picture, a video, a contact or a location, how to manage WhatsApp downloads to save data, how to use WhatsApp web. They also learned some tricks a regular WhatsApp user might ignore. For example, each student now has his/her own contact in his/her WhatsApp, so they can send notes (voice and text) to themselves to remind them what to report to a doctor, what to buy at the supermarket and so on. It is great but not enough. They want to go further, so now we just decided to move forward with other apps. After all, my challenge now is to cater to so many different interests and needs related to smartphones. 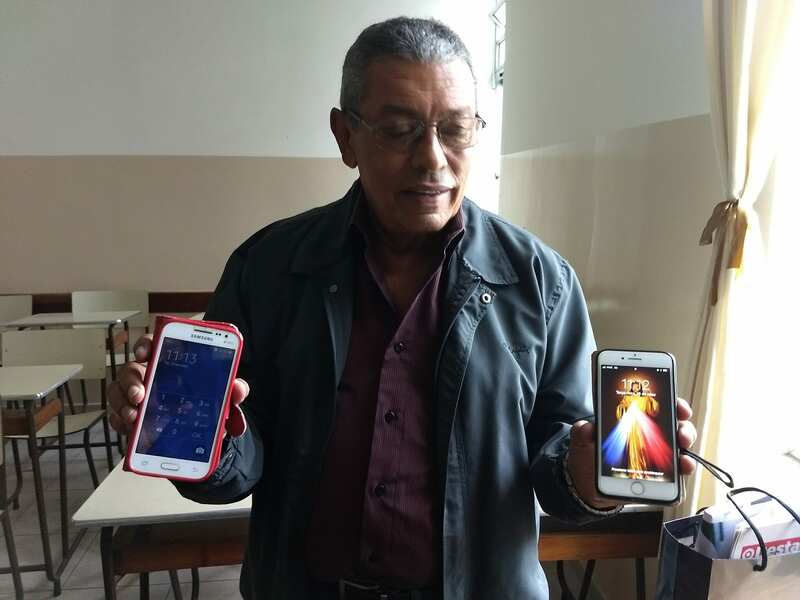 As my colleague, Alfonso Otaegui, who is also volunteering in smartphone courses in Chile, said in his previous post here, old people have different expectations of smartphone usage. As a teacher, this might help me make more effort to show empathy in class. As an ethnographer, this represents a great opportunity to understand how their particular needs and curiosity about pictures, books, music, travel, languages, cooking and shopping apps reflect the very particular way each of them experience age and how smartphones can help them to get what they want. If we consider the POnline2017 Survey from Acessa SP, an initiative for digital inclusion in São Paulo that provides free access to internet and many free courses to help users to improve their digital skills, over 70% of respondents learned to use the internet by themselves or attending to courses and just 4% could count on their relatives’ help. Thank you for your interesting post. I’m a linguist researching computer-mediated communication, especially Whatsapp and in my research I’m always been attracted by how old people use technology. As you have noticed, I think that one of the most important obstacle they find is the need to change their mindset and embrace the “trial-and-error” learning, as they mainly rely on a traditional view of learning (for example, reading the instructions or, as in the case of your experience, attending a course). Giving them the possibility to learn with a style coherent with their need is a good opportunity for them to overcome the technological divide. In my case, it was really fascinating to study how old people, once familiarized with the application, communicate with young relatives through Whatsapp. Thanks again for the interesting post and the project and good luck for your fieldwork.